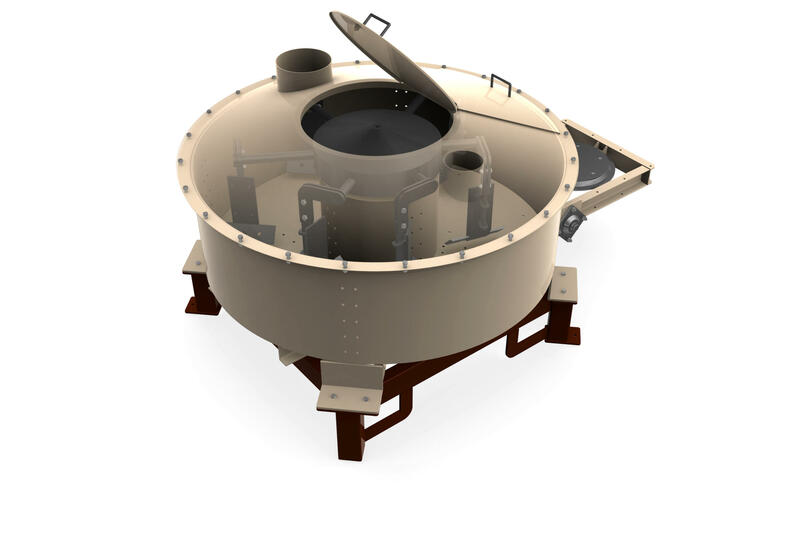 The mixer is suit­able for prepar­ing mix­tures without addi­tion of water. The mixing takes place inside the mixer thanks to the action of paddles. If required by the cus­tomer, the bottom and the side-walls can be lined with a special abra­sion-resis­tant mate­r­ial. The mate­ri­als ingre­di­ents are fed into the mixer through two feeding open­ings with a diam­e­ter of 255 mm (10). Minor ingre­di­ents are intro­duced into the mixer through a small window. Another opening with a diam­e­ter of 155 mm (6) is used for venting the mixer during its filling or emp­ty­ing. There is a cir­cu­lar dis­charge opening in the bottom of the mixer. The opening is con­trolled by means of an air-oper­ated mechan­i­cal device. The opening remains closed even if there is a failure in the supply of com­pressed air. This dis­charge opening is pro­vided with a flange, there­fore, the mixer can be con­nected to a respec­tive han­dling system easily.